Join the Affiliate program and earn online by recommending our services and products! It's fast, easy and free! Start by creating an account on our Website and join the Affiliate Program. You do not need to have any services to do that. Create your free Affiliate profile today! You will get your referral link right after you join the program. Copy your referral link and share it with potential customers, a cookie file is saved onto their computers and remain active for 3 months. When people who have clicked at your link buy any product or service within that time you earn 25% of what they pay. Withdraw the accumulated amount by PayPal, minimum payout is $100 (€75). You can also apply it to your credit and use to pay for our services. You keep earning the revenue each billing cycle, every following month or year until the customer remains active. When you sign in as an affiliate, you get a unique affiliate link that leads to FastCast4u webpage. If anyone who has clicked at your affiliate link visits our Website and registers he becomes your Affiliate. 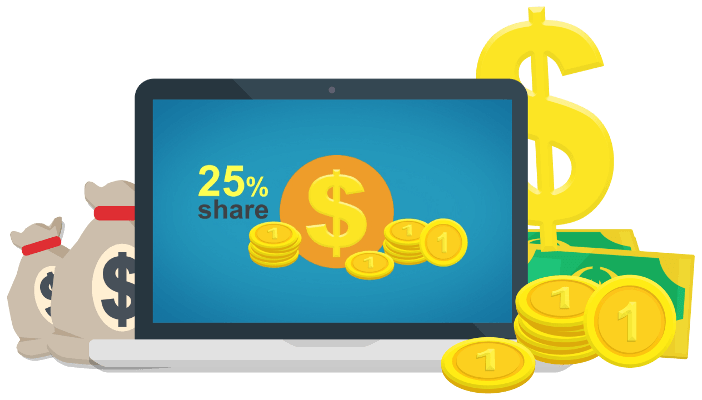 You will earn 25% not only on the initial sale, but also on any recurring payments they make and on each new service they will get. Each month you can earn more and more with all recurring payments and still invite new customers! After joining our affiliate program you will get access to real-time statistics. You can easily check the number of visitors referred to our website with your unique link, the number of sales and commisions earned. You will be also able to measure your efficiency knowing the conversion rate. Each month you will receive Affiliate Monthly Referrals Report via email with your new signups this month and current earnings. There are many ways to promote your unique affiliate link and refer new customers. The easiest way is to add this link with short description in your email footer. Everybody sends a number of emails each day. You never know if there is no potential customers among the receivers of your messages. Are you active on any forum? Great! It can be very efective to place an Affiliate link in your signature. It will be visible under each post you've ever written on forum. Use your social media profiles on Facebook, Google+, Twitter and such to include link in your biographical information and be sure to post your affiliate link on each platform few times a week.